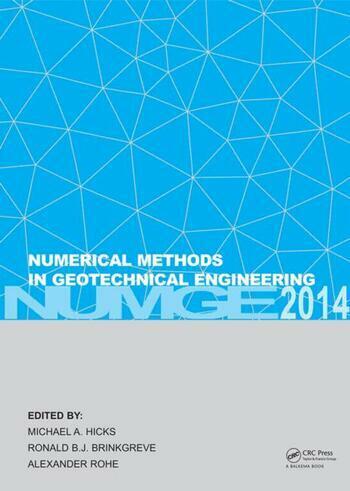 Numerical Methods in Geotechnical Engineering contains the proceedings of the 8th European Conference on Numerical Methods in Geotechnical Engineering (NUMGE 2014, Delft, The Netherlands, 18-20 June 2014). It is the eighth in a series of conferences organised by the European Regional Technical Committee ERTC7 under the auspices of the International Society for Soil Mechanics and Geotechnical Engineering (ISSMGE). The first conference was held in 1986 in Stuttgart, Germany and the series has continued every four years (Santander, Spain 1990; Manchester, United Kingdom 1994; Udine, Italy 1998; Paris, France 2002; Graz, Austria 2006; Trondheim, Norway 2010). Numerical Methods in Geotechnical Engineering presents the latest developments relating to the use of numerical methods in geotechnical engineering, including scientific achievements, innovations and engineering applications related to, or employing, numerical methods. Topics include: constitutive modelling, parameter determination in field and laboratory tests, finite element related numerical methods, other numerical methods, probabilistic methods and neural networks, ground improvement and reinforcement, dams, embankments and slopes, shallow and deep foundations, excavations and retaining walls, tunnels, infrastructure, groundwater flow, thermal and coupled analysis, dynamic applications, offshore applications and cyclic loading models. The book is aimed at academics, researchers and practitioners in geotechnical engineering and geomechanics.